Posted in Appetizers, on January 24th, 2018. A lovely tasting cheese ball, suitable for anytime. The little bit of horseradish in it gives it a different and subtle hint of it – not at all overpowering. Cheese balls are so appropriate for the holidays. I made this a few days before Christmas and took it to daughter Sara’s house. We were spending the afternoon making tamales, but we ended up eating this and a big pan full of nachos (with the leftover pork and red chile tamale filling and a bunch of jack cheese sprinkled on top) as dinner. After the tamale fest, everyone was fatigued with the process, and the last thing Sara wanted to do was prepare a sit-down dinner. So out came the cheese ball and we just noshed. For the last several months I’ve subscribed to the New York Times’ daily food section email. And of course, they want me to subscribe (the pay type, and no, I’m not doing that), and every day they remind me that I’m not subscribed, but yet I am able to access the recipes they include in those emails. Most of the time there isn’t anything all that noteworthy, but occasionally they rave about something. And the last week of December they mailed out links (and photos) of the favorites of 2017. This is one of them. And they particularly mentioned the hint of horseradish gave it really great flavor. 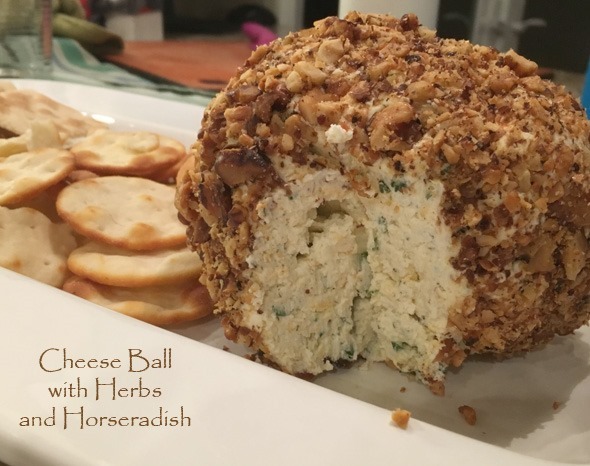 There are two steps to making this: (1) the nut coating; and (2) the cheese ball. You use a stand mixer for the cheese – maybe it could be done with a hand-held mixer (try it and see) but the stand mixer made it easy to combine the ingredients. The nut coating (walnuts, maple syrup, butter and salt) is roasted in the oven until just golden brown, then you chop up the nuts and set those aside. The cheese ball needs to be refrigerated for a few hours (I did mine overnight) and just before serving you roll the ball in the nut mixture and onto a serving platter it goes. Very simple, and nice to make ahead if you’re having a group over and want minimal fuss at the last minute. The recipe calls for cream cheese, cheddar and Gruyere. I didn’t have the last one, and Trader Joe’s was out of Gruyere (darn) but I found another Swiss type cheese that was similar. I do not recommend you use a domestic Swiss cheese in this – whatever it is American cheese producers do to our Swiss cheese, well, let’s just say I don’t want that flavor profile in the cheese ball. I used Emmental and it was perfect. The herbs add a nice little green hint throughout, and of course, the horseradish, to me, is the subtle star of the show. Also liked the nut coating. What’s GOOD: loved the horseradish hint in the mixture, and enjoyed the cheese combo too. Very tasty. Easy to make, really, and I like that it all can be made ahead except for rolling the ball in the nuts. A keeper. I see why it made the best of 2017 at the N.Y. Times. I will say, that there is another cheese ball in my life, Bombay Cheese Ball, and I may just like it the best but if you’re not into Indian-style spices (i.e., curry), then this one would be a better choice. 1. NUT COATING: Preheat oven to 375° F. Line a sheet tray with parchment paper. Set aside. 2. In a medium bowl, mix together maple syrup, butter, and 1/2 teaspoon salt. Add the walnuts and toss to coat. Pour the nuts onto the parchment lined sheet tray and roast for 8 minutes or until nuts are lightly toasted and fragrant. Set aside to cool. Once cool, roughly chop the nuts to a finer grind. 4. When you’re ready to serve, remove the cheese ball from the fridge for 20 minutes to soften a bit. Roll the cheese ball in the nuts to coat. Serve with crackers and fresh veggies. Per Serving: 345 Calories; 31g Fat (78.1% calories from fat); 13g Protein; 6g Carbohydrate; 1g Dietary Fiber; 65mg Cholesterol; 435mg Sodium. This sounds lovely, especially with that maple walnut coating. I do enjoy horseradish, too.